Wits Vuvuzela speaks to the Wits students that took the prized title as winners of the National Budget speech competition. Looking at the winners of the national budget speech competition, it is safe to say that the future of the country would be safe in the hands of Witsies. 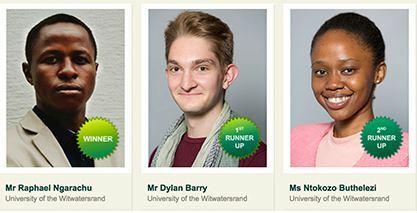 Wits students dominated the undergraduate category of the Nedbank and Old Mutual Budget Speech Competition, which was run online ahead of Finance Minister Pravin Gordhan’s budget speech. All three winners of the competition were Witsies. Finance honours student, Raphael Ngarachu, took first place and walked away with R60 000. Dylan Barry came second, while third place was taken by Ntokozo Buthelezi. The competition closed last May following an invitation to all South African university students to answer a question that sought solutions to the country’s education challenges. Wits third year economics students are encouraged to tackle the question as part of their course requirements, but entering the competition is voluntary. “I initially didn’t know what I was doing,” said Ngarachu. “I chose to focus on the quality of the teaching force. The underlying message of my essay was that the quality of education can’t surpass the teaching force,” said Ngarachu. WINNERS’ CORNER: Raphael Ngarachu, Dylan Barry and Ntokozo Buthelezi have represented Wits well. Buthelezi’s essay also focused on the teaching force. “I saw the opportunity as my first chance to apply my ability to think critically,” said Buthelezi, who was studying toward a BCom Economics and management degree when she submitted her essay to the competition. The competition is designed to create a platform for university students to critically think about the economic issues in South Africa. Wits led the group of finalists in the competition boasting five out of the 10 finalists in the undergraduate competition. Witsies claimed R120 000 – the full value of the prize money in the category. “I’ll probably further my education with the money,” said Ngarachu. “At this stage it’s quite premature. I’d be lying to say I even thought I had a chance,” said Ngarachu.